Stunt king Banksy positively out-stunted himself by triggering a self-destruct mechanism in one of his works immediately after it sold at auction—for $1.4 million. A copy of the street artist’s famous “Balloon Girl” mural was sold at London’s Sotheby’s auction house Friday night. But as soon as the auctioneer’s hammer fell, the work began destroying itself via a shredder hidden inside its frame. 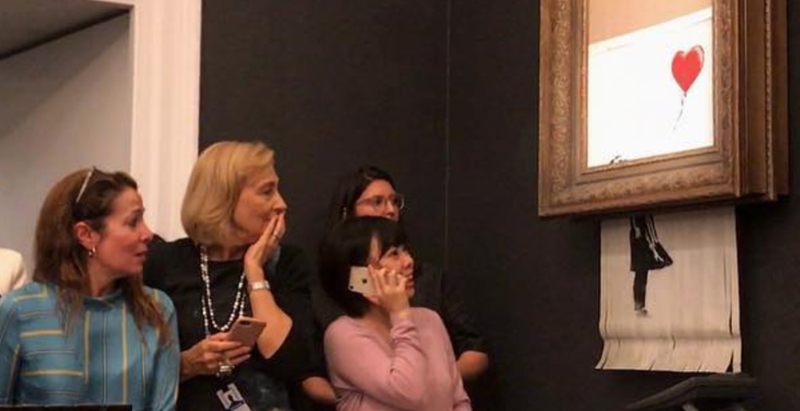 “It appears we just got Banksy-ed,” Sotheby’s senior director Alex Branczik told The Art Newspaper. The auction house released a statement saying that it was discussing “next steps” with the surprised buyer. 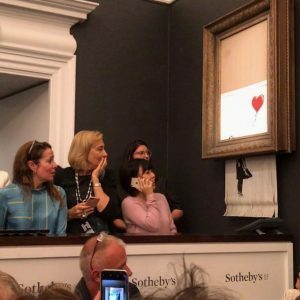 Though the stunt was just the sort of obvious and ham-fisted critique of authority and materialism that Banksy has been pulling for what now feels like centuries, “Balloon Girl” might, perversely enough, turn out to be worth more money shredded than it was intact.